The Cincinnati Kid, directed by Norman Jewison, is one of the finest and first card-related films, which tells us the story of ’The Kid’ and ’The Man’. Watching this film provides us with a glimpse back in time, letting us get to know the wild gambling world of America in the Sixties. The film’s opening scene revolves around a card game and just like in old Western movies, the suspicion of cheating arises and a battle between knives rather than cards begins. Throughout the film, there are numerous other card showdowns and even time for a cockfight. 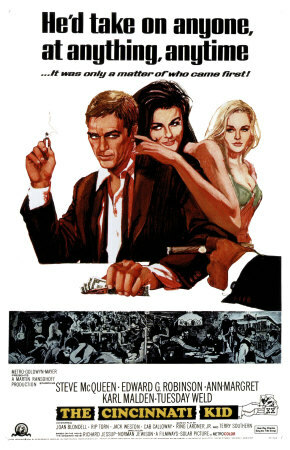 The film’s plot in short: The Kid (Steve McQueen) is an uprising card player, who gets wind of the all-time best Stud player, The Man being in town, decides to challenge his skills in a showdown. The first half of the film is a build-up for the big match, while the second half is the game itself, which goes on for hours, to determine who really is the best. 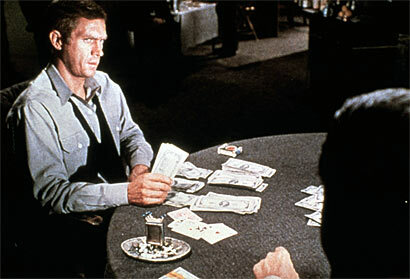 The game played in the film is Five-Card Stud and in an ’open stakes’ way, anything can be on stake, not only the money on the table. It is an interesting fact to note, that according to Card Player magazine, the odds of the two hands meeting at the end of the film are less than 45 million to 1. (The last hand, known as a spoiler, can be viewed through the link below). Because of the great actors together with the good plot and wonderful atmosphere, this all comes together nicely, making it a film not miss.